According to the Facebook page of Happy Little Guillotine Studios, a company who specializes in creating advertisement campaigns and full-length television series using client company’s intellectual properties, “Escape From Team Fortress II“ is in post-production and is planned to be released in 2015. Just wrapped my recording session for @HLGStudios &@Machinima ‘s new show “Escape From Team Fortress II” Super stoked to be a part of it!! 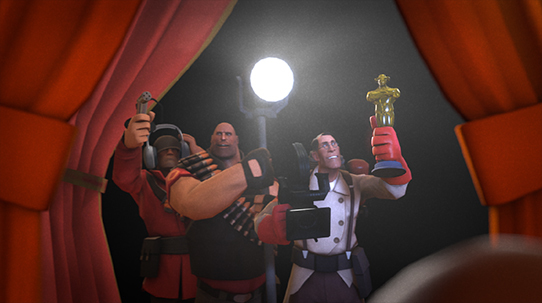 It’s unclear how the cinematic of the plot will actually roll out on-screen, especially under the assumption that there will be an incorporation of live action actors into a show that will probably be set in an animated environment, potentially using Source Filmmaker. The expansion of Team Fortress 2 beyond it’s video game roots in this manner shows that Valve maybe considering exploring other potential directions for the franchise. Could this show be the beginning of a very unexpected direction for our favorite ragtag team of mercenaries? Next Next post: What was up with those Alien Promos?